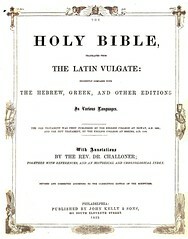 Title The / Holy Bible, / Translated from / The Latin Vulgate: / Diligently Compared with / the Hebrew, Greek, and Other Editions / in Various Languages, / The Old Testament Was First Published by the English College at Doway, A.D. 1609; / and the New Testament, by the English College at Rheims, A.D. 1582. / Revised with Annotations / by the Right Rev. R. Challoner, D.D. / together with References, and an Historical and Chronological Index. / Now Carefully Corrected According to the Clementine Edition of the Scriptures. / Philadelphia: / Published by John Kelly & Sons, / 621 South Eleventh Street. / 1872. 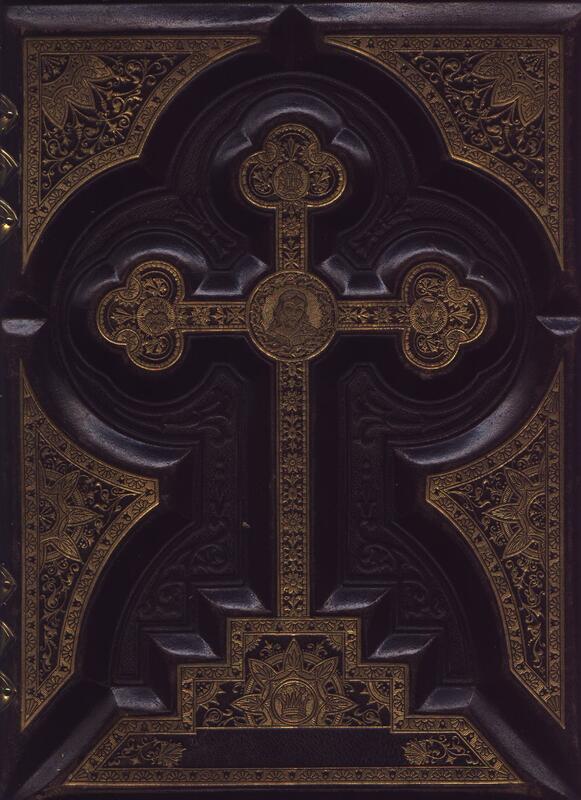 Title The / Holy Bible, / Translated from / The Latin Vulgate: / Diligently Compared with / the Hebrew, Greek, and Other Editions / in Various Languages, / The Old Testament Was First Published by the English College at Doway, A.D. 1609; / and the New Testament, by the English College at Rheims, A.D. 1582. / with Annotations / by the Rev. R. Challoner; / together with References, and an Historical and Chronological Index. / Now Carefully Corrected According to the Clementine Edition of the Scriptures. / Philadelphia: / Published by John Kelly & Sons, / 621 South Eleventh Street. / 1872. Recent Sales A copy of this edition sold on Ebay October 23, 2013 for $579 (Ebay No. 221295037621). Comment Very similar to the above except the word "Revised" is omitted before "with Annotations," and the terms "Right" and "D.D." are omitted from Challoner's title. Comment A variant of the above edition with a decorative border added. 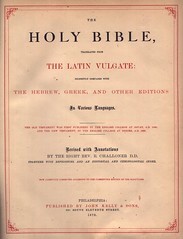 Title The / Holy Bible, / Translated from / The Latin Vulgate: / Diligently Compared with / the Hebrew, Greek, and Other Editions / in Various Languages. / The Old Testament Was First Published by the English College at Douay, A.D. 1609; / and the New Testament, by the English College at Rheims, A.D. 1582. / Revised with Annotations / by the Right Rev. R. Challoner, D.D. / together with References, and an Historical and Chronological Index. / Now Carefully Corrected According to the Clementine Edition of the Scriptures. / Philadelphia: / Published by John Kelly & Sons, / 621 South Eleventh Street. / 1873. Recent Sales A copy of this edition sold for $459 on Ebay August 28, 2014 (Ebay No.321498600764). A copy sold for $436.25 on March 14, 2015. See Ebay No. 201302750315. 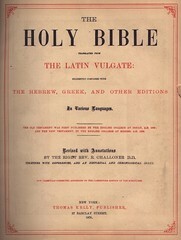 Title The / Holy Bible / Translated from / The Latin Vulgate: / Diligently Compared with / the Hebrew, Greek, and Other Editions / in Various Languages. / The Old Testament Was First Published by the English College at Douay, A.D. 1609; / and the New Testament, by the English College at Rheims, A.D. 1582. / Revised with Annotations / by the Right Rev. R. Challoner, D.D. / together with References, and an Historical and Chronological Index. / Now Carefully Corrected According to the Clementine Edition of the Scriptures. / New York: / Thomas Kelly, Publisher, / 17 Barclay Street. / 1874. 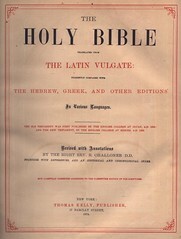 Comments This and later editions show the publisher as Thomas Kelly of New York. It is unknown whether John and Thomas Kelly are related. Recent Sales A copy of this edition sold for $425 on Ebay (Item No. 390254292994) on October 25, 2010. Another copy sold for $400 on August 19, 2018 (Ebay # 302836844511). 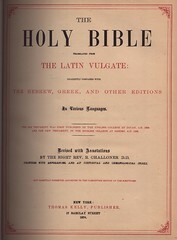 Title The / Holy Bible, / Translated from / The Latin Vulgate: / Diligently Compared with / the Hebrew, Greek, and Other Editions / in Various Languages. / The Old Testament Was First Published by the English College at Doway, A.D. 1609; / and the New Testament, by the English College at Rheims, A.D. 1582. / Revised with Annotations / by the Right Rev. R. Challoner, D.D. / together with References, and an Historical and Chronological Index. / Now Carefully Corrected According to the Clementine Edition of the Scriptures. / New York: / Thomas Kelly, Publisher, / 17 Barclay Street. / 1875. 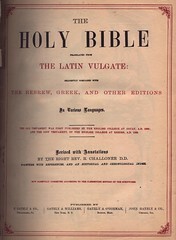 Title The / Holy Bible, / Translated from / The Latin Vulgate: / Diligently Compared with / the Hebrew, Greek, and Other Editions / in Various Languages. / The Old Testament Was First Published by the English College at Douay, A.D. 1609; / and the New Testament, by the English College at Rheims, A.D. 1582. / Revised with Annotations / by the Right Rev. R. Challoner, D.D. / together with References, and an Historical and Chronological Index. / Now Carefully Corrected According to the Clementine Edition of the Scriptures. / New York: / Oliver F. Brown & Bros., Publishers / 31 Exchange Street. / 1875. Comments An edition of the above with a different publisher imprint. The cover design shown is common on editions in this series. 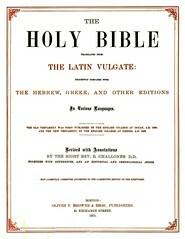 Title The / Holy Bible / Translated from / The Latin Vulgate: / Diligently Compared with / the Hebrew, Greek, and Other Editions / in Various Languages. / The Old Testament Was First Published by the English College at Douay, A.D. 1609; / and the New Testament, by the English College at Rheims, A.D. 1582. / Revised with Annotations / by the Right Rev. R. Challoner, D.D. / together with References, and an Historical and Chronological Index. / Now Carefully Corrected According to the Clementine Edition of the Scriptures. / Boston: / Thomas Kelly, Publisher, / 17 Barclay Street. / 1876. Sales Reported A copy of this edition was reported sold on Ebay on July 19, 2017 for $400 (Ebay No. 201990338705). 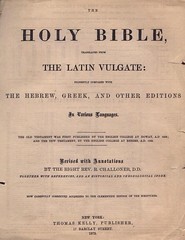 Title The / Holy Bible, / Translated from / The Latin Vulgate: / Diligently Compared with / the Hebrew, Greek, and Other Editions / in Various Languages. / The Old Testament Was First Published by the English College at Douay, A.D. 1609; / and the New Testament, by the English College at Rheims, A.D. 1582. / Revised with Annotations / by the Right Rev. R. Challoner, D.D. / together with References, and an Historical and Chronological Index. / Now Carefully Corrected According to the Clementine Edition of the Scriptures. / New York: / Thomas Kelly, Publisher, / 17 Barclay Street. / 1877. 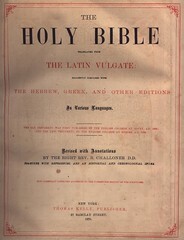 Title The / Holy Bible, / Translated from / The Latin Vulgate: / Diligently Compared with / the Hebrew, Greek, and Other Editions / in Various Languages. / The Old Testament Was First Published by the English College at Douay, A.D. 1609; / and the New Testament, by the English College at Rheims, A.D. 1582. / Revised with Annotations / by the Right Rev. R. Challoner, D.D. / together with References, and an Historical and Chronological Index. / Now Carefully Corrected According to the Clementine Edition of the Scriptures. / New York: / Thomas Kelly, Publisher, / 17 Barclay Street. / 1878. Recent Sales A copy of this edition sold for $470 on December 12, 2011 on Ebay (Ebay No. 170744359286). 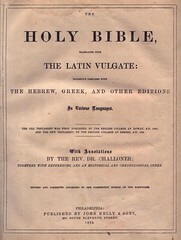 Title The / Holy Bible / Translated from / The Latin Vulgate: / Diligently Compared with / the Hebrew, Greek, and Other Editions / in Various Languages. 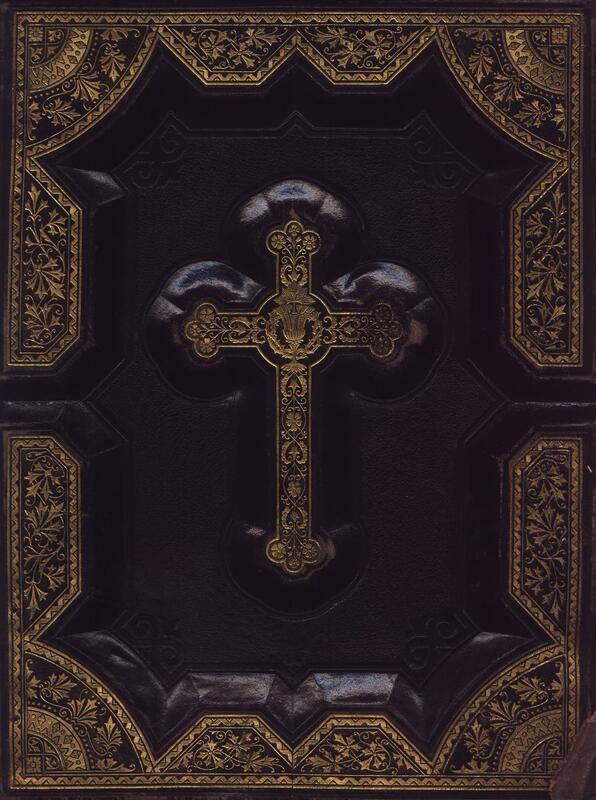 / The Old Testament Was First Published by the English College at Douay, A.D. 1609 / and the New Testament, by the English College at Rheims, A.D. 1582. / Revised with Annotations / by the Right Rev. R. Challoner, D.D. / together with References, and an Historical and Chronological Index. / Now Carefully Corrected According to the Clementine Edition of the Scriptures. / New York: / Thomas Kelly, Publisher, / 17 Barclay Street / 1879. Recent Sales A copy of this edition sold for $400 on September 2, 2010 on Ebay (Ebay No. 260657713809). 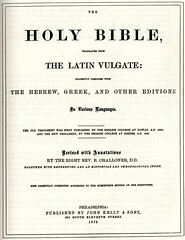 Title The / Holy Bible / Translated from / The Latin Vulgate: / Diligently Compared with / the Hebrew, Greek, and Other Editions / in Various Languages. 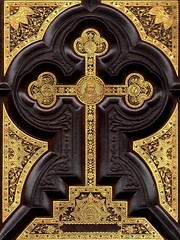 / The Old Testament Was First Published by the English College at Douay, A.D. 1609 / and the New Testament, by the English College at Rheims, A.D. 1582. / Revised with Annotations / by the Right Rev. R. Challoner, D.D. / together with References, and an Historical and Chronological Index. / Now Carefully Corrected According to the Clementine Edition of the Scriptures. / New York: / Thomas Kelly, Publisher, / 17 Barclay Street. / 1880. Recent Sales A copy sold on Ebay December 6, 2010 for $400 (Ebay No. 110618310438). Another Ebay sale on October 20, 2011 went for $400.00 (Ebay No. 250914667539). 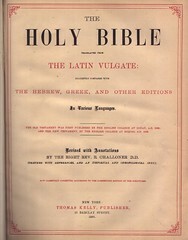 Title The / Holy Bible / Translated from / The Latin Vulgate: / Diligently Compared with / the Hebrew, Greek, and Other Editions / in Various Languages. / The Old Testament Was First Published by the English College at Douay, A.D. 1609; / and the New Testament, by the English College at Rheims, A.D. 1582. / Revised with Annotations / by the Right Rev. R. Challoner, D.D. / together with References, and an Historical and Chronological Index. / Now Carefully Corrected According to the Clementine Edition of the Scriptures. 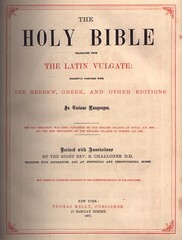 / Published by / E. Gately & Co., / Philadelphia, Pa. / Gately & Williams, New York, N.Y. / Gately & O'Gorman, / Boston, Mass. / John Gately & Co., /`Chicago, Ill.